I have checked my database and nothing has been deleted. This error message can be misleading. The error is caused when one or more Queuestatus modules present in active Jobs or Monitor windows in the Client has lost connection to a printer Output. This most commonly happens after a software upgrade or when connecting the Serendipity Client to an alternate Server to which it has never connected before. 1. Dismiss the Notifier message by clicking the Dismiss or Dismiss All buttons. 3. 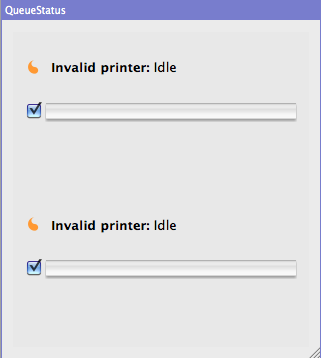 Right-click on the Queuestatus window displaying the ‘Invalid Printer’ to open the contextual menu. 4. Select the Change Queue option to assign a single Output or select Queue Order to assign multiple Outputs. 5. 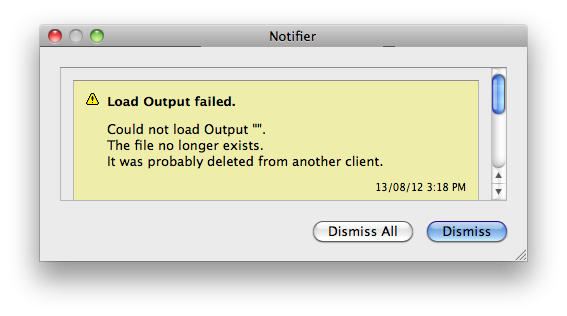 Repeat for all Queuestatus modules, then Quit and Restart the Serendipity Client to Save your Queues.